General introduction to place branding. Overview of the 7 stages to develop or revitalize your place brand. Clear examples illustrating how to implement each of the 7 stages of brand development. Discussion the 4 steps to successfully launching a place branding campaign. 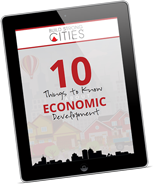 Video – 8 types of advertising campaigns that support local economic development. Video – 7 common traits of an effective ad. Video – Messaging Matrix, the one tool every economic development marketer needs. Bonus Behind the Scenes Campaign Launch.